A couple of weeks ago, the Irish Times‘ Patrick Freyne wrote a piece describing twenty-four hours on O’Connell Street, Dublin. Freyne was primarily concerned with reporting the people he encountered over this period and the activities, not least widespread drug dealing, that he witnessed on what is regularly touted as the Irish capital’s principal thoroughfare. He did not discuss the street’s present appearance nor the possibility that this might have consequences for the way in which it is treated (and often mistreated). 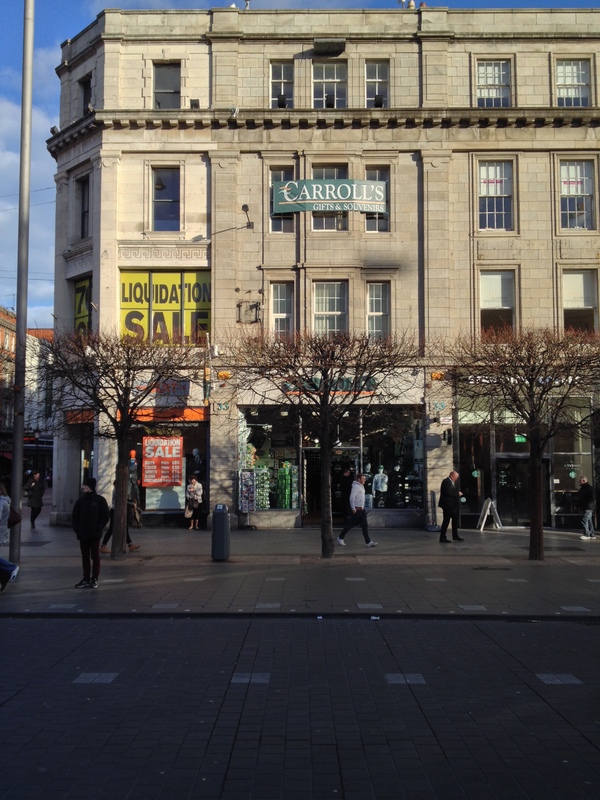 So herewith a brief history of O’Connell Street and some thoughts on the way it has been allowed to slide into the sorry state seen in the accompanying photographs, all taken within the past fortnight. The earliest section of O’Connell Street was laid out in the late 17th century by the land’s then-owner Henry Moore, third Earl of Drogheda who, the vainglorious creature, gave his name to different sections of the development: hence Earl, Henry and Moore Streets (there was once even an Of Lane). Drogheda Street, which ran south from what is now Parnell Street to the junction with Abbey Street, was much narrower than its successor on which work began c.1749 thanks to the vision of that key figure in the development of 18th century Dublin, Luke Gardiner. He was responsible for creating an elongated residential boulevard or mall some fifty feet wide and 1,050 feet long, the centre being a tree-lined public space with granite walls and obelisks topped with oil-fuelled lamp globes. Gardiner named his development Sackville Street, after the Lord Lieutenant of the time, Lionel Sackville, first Duke of Dorset. It quickly became a fashionable district in which to live. As Maura Shaffrey commented in the Irish Arts Review Yearbook 1988-89, ‘No expense was spared by the wealthy residents of Sackville Street, many of whom were Members of Parliament; they commissioned the best known architects and designers of the day to build, decorate, and fit out their homes in the most elegant styles. The architecture of the east side, built largely for prominent men, was superior to that of the west side which was developed mostly by speculative builder/architects.’ The largest residence of all, Drogheda House, had a sixty-feet frontage on the north corner of what is today Cathedral Street. Below are two pictures of Sackville Street in its heyday, the first dating from 1843, the second a postcard presumed to be from the late 19th/early 20th century. At the time of its original development, O’Connell Street only continued as far as the junction with Henry Street, although it was always Gardiner’s intention to extend the thoroughfare as far as the river Liffey. This gradually occurred from the late 1770s onwards, aided by the involvement of Dublin’s Wide Streets Commissioners and by the opening of Carlisle Bridge in 1795: designed by James Gandon, this directly linked the street with the south side of the city. 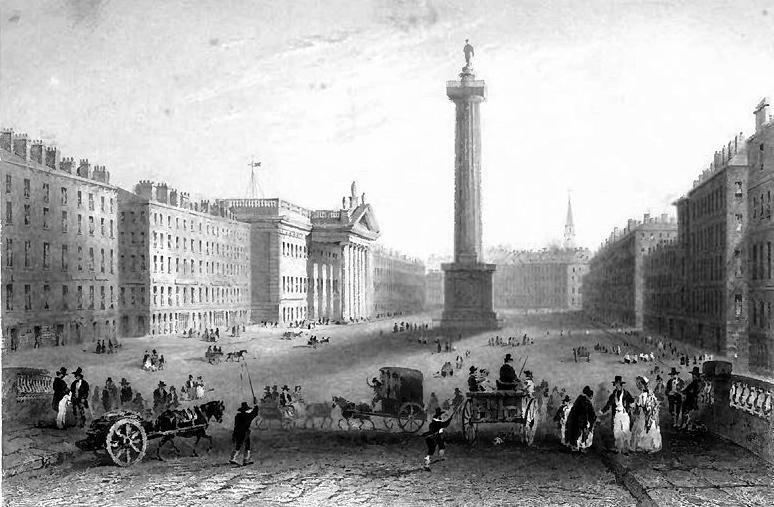 Two significant additions in the first decades of the 19th century were the erection in 1808 of a 121 foot tall granite Doric Column at the junction of the upper and lower sections and topped by a statue of Horatio Nelson, and a decade later the opening of the adjacent General Post Office designed by Francis Johnston. The arrival of the bridge and the GPO inevitably affected the hitherto-residential character of the street and gradually commercial concerns were established there with the advent of hotels, banks and so forth. 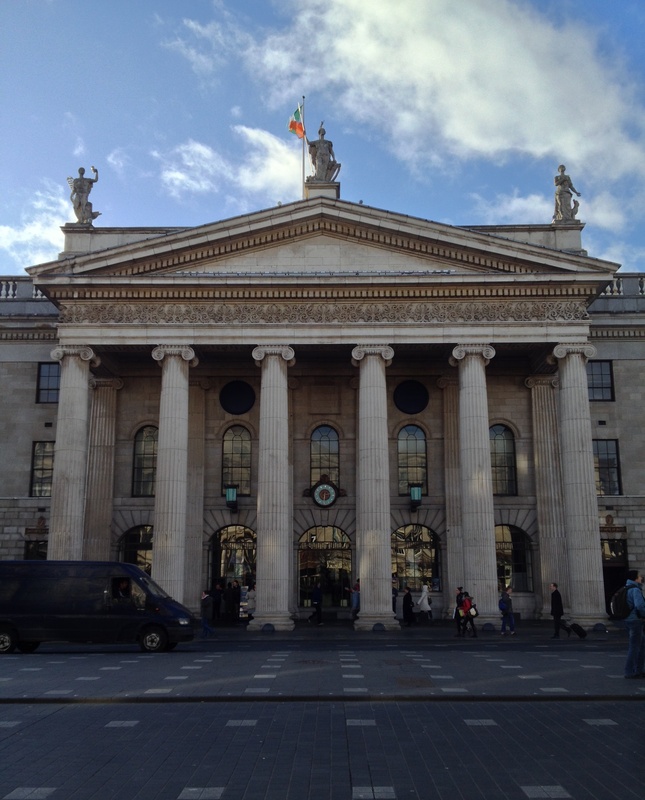 Nevertheless, O’Connell Street’s original dignified appearance remained as did many of the 18th century buildings..
With its centre of operations inside the GPO the Easter Rising in 1916 devastated the whole area, much of which was laid waste. However, reconstruction afterwards was rapid; in her book on Dublin Christine Casey notes the rebuilding programme was ‘diverse in expression, united only by restrictions on height, a prescribed cornice level and a predominantly classical vocabulary.’ In fact, this was ample to give the street coherence, as was the widespread use of cut granite for the facades. Some of these have survived, as can be seen below. Unfortunately too many are spoiled by the uncurbed use of signage inappropriate in both size and character. 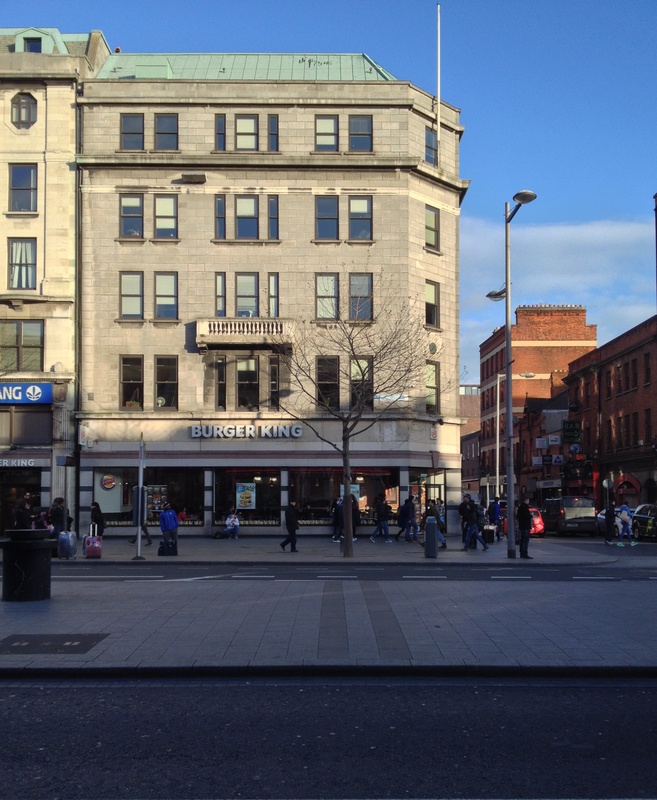 Over the past ninety years the east side of O’Connell Street has fared better than its western counterpart. 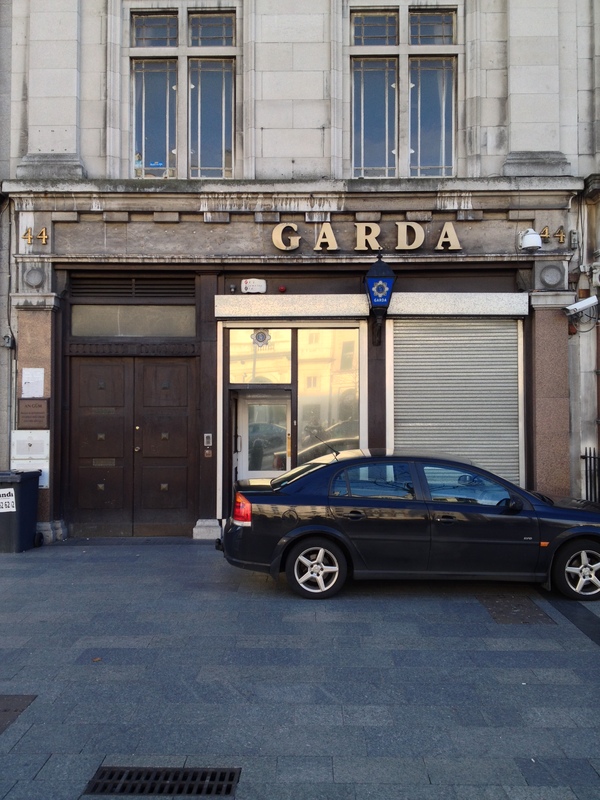 Despite some ill-considered shop-frontages, the majority of the former’s buildings remain much as they were redeveloped in the aftermath of the Easter Rising. 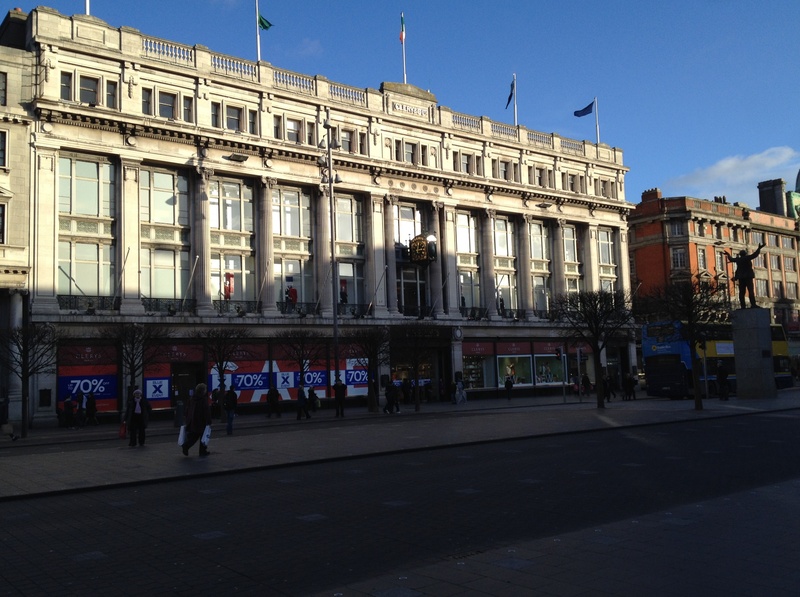 Among the more significant is Clery’s Department store dating from 1918-22. Its design is indebted to that of Selfridges in London, and it has a splendid Portland Stone facade which, aside from a certain amount of tinkering with some of the details, has largely survived, as have the majority of interior features like the marble staircase. When first opened the arches behind the portico were unglazed and formed an arcade secured at close of business by iron gates. However, the building was subject to many alterations during the 19th century, so many indeed that by 1888 removal of internal support walls threatened the entire structure’s collapse. The main hall, memorably described by Christine Casey as being ‘like the lobby of a great Art Deco hotel’ dates from the second half of the 1920s. An Post has recently announced proposals to fill in the courtyard behind in order to create a 1916 museum. As yet no designs have been produced to show what form this might take. 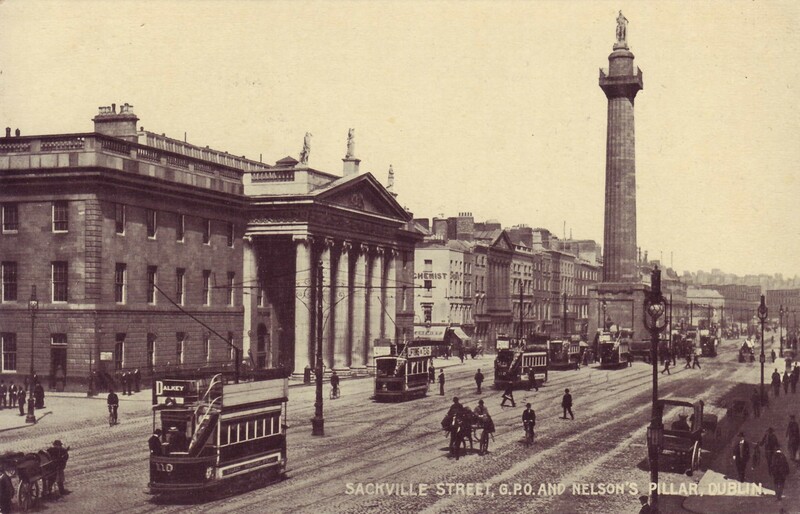 Many of O’Connell Street’s present problems have their origins in the 1970s, although the destruction of Nelson’s Pillar by members of the IRA in March 1966 did not help: the thoroughfare’s appearance suffered from the absence of a monument which matched its grandiose scale. 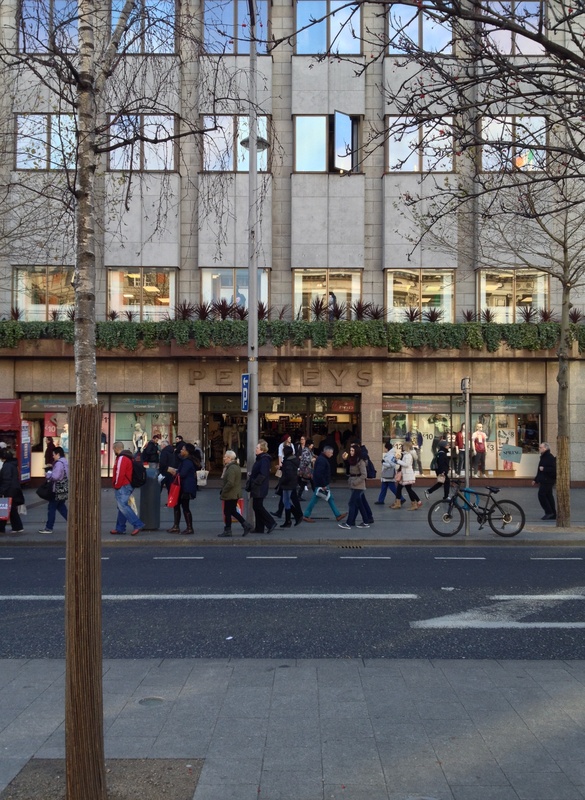 However, within a decade it was the demolition of older buildings and their inferior replacements – such as that now housing a branch of Penneys on the corner of Prince’s Street beside the GPO (built 1976-78) – which most clearly demonstrated the want of interest by relevant authorities in following the example of their forebears and maintaining decent standards of design. In addition, around the same period the first branches of now-ubiquitous fast food outlets arrived on the street, and again no effort was made to restrain their branding so that it was sympathetic to the surrounding environment. It is the west side of O’Connell Street north from the junction with Henry Street, which has suffered most in the past forty years from poor planning and lack of engagement by Dublin City Council. Astonishingly this section of the street largely survived the effects of the 1916 Rising, but what wasn’t destroyed then has been grossly violated in recent decades. 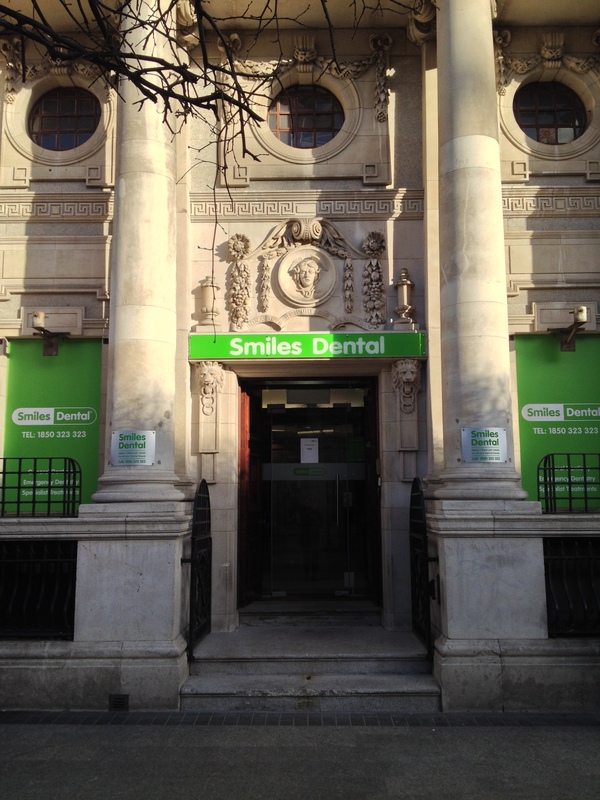 For example, the sandstone facade of the former Standard Life Assurance Company building which dates from 1861 and can be seen in the early postcard of the street a little beyond the GPO still stands, but with its ground floor butchered in the 1970s. Like so many other buildings along here, it is now boarded up and empty and the consequences of neglect are increasingly visible. The same is also true several doors further north where the former Colonial Assurance Company building, constructed 1863 in Ruskinian gothic with tiers of round-headed arches, is likewise unused. Immediately beside this is probably the first post-Independence intervention in the street, a predominantly glass-fronted office block developed in 1959 for Córas Iompair Éireann and now used by Dublin Bus. Of its kind it is by no means unsuccessful but, as frequently tends to be the case here, the building makes no attempt to empathise with its context: on the contrary, it flagrantly ignores the architecture of neighbours. Further north along the west side of O’Connell Street an already tawdry state of affairs grows rapidly worse, not least thanks to two large vacant sites and to the empty buildings found on either side of them. During the boom years property company Chartered Land spent six years and an estimated €180 million acquiring some 5.5-acres of land here: the intention was to engage in comprehensive redevelopment including 700,000 square feet of retail outlets as well as leisure and residential elements, the whole budgeted at €1.25 billion. In the event, the economic downturn put paid to those notions, which is probably just as well since the scheme proposed was grotesquely over-proportioned and, yet again, completely ignored its surroundings. One especially ludicrous feature was the inclusion of what was trumpeted as a ‘park in the sky’, in other words a public roof garden thirteen storeys above ground: fortunately this part of the project was scrapped before An Bord Pleanála granted permission in March 2010 with building heights limited to around six storeys. That was almost four years ago and since then nothing has happened, other than the fabric of extant buildings in the ownership of Chartered Land has continued to deteriorate and the character of this part of O’Connell Street has continued to decline. 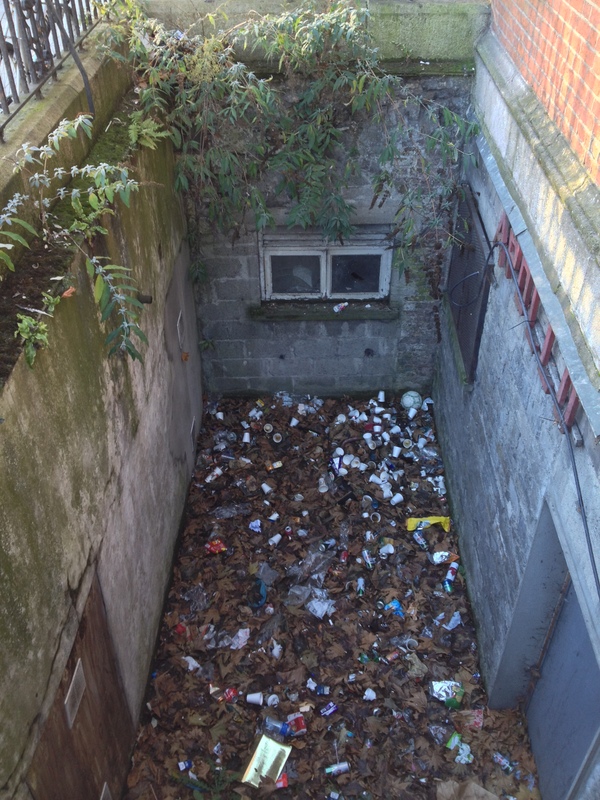 And, as is ever the case, Dublin City Council has continued to do nothing to resolve the situation, allowing this part of O’Connell Street to grow every more shabby. Below is No. 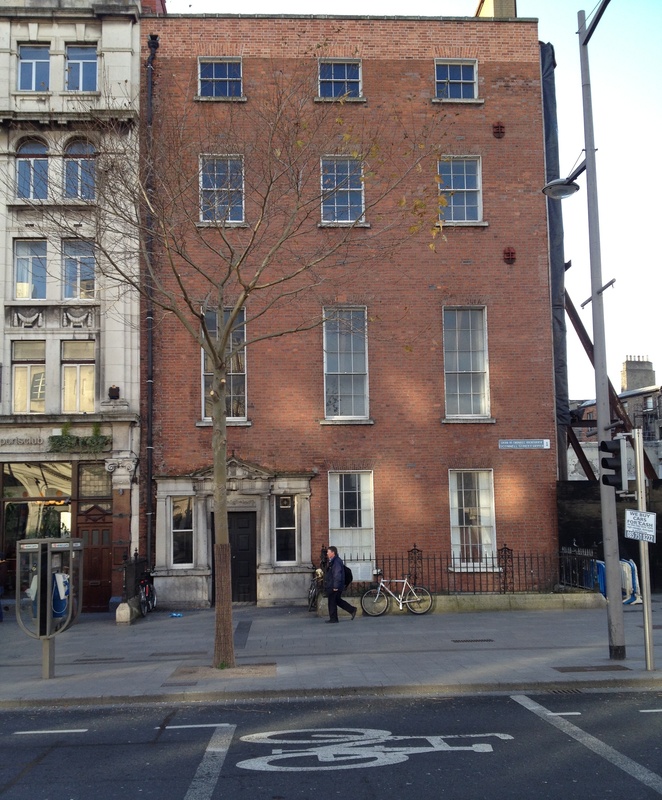 42 O’Connell Street, the last surviving 18th century house on the thoroughfare. In 1752 the plot on which it stands was leased to Dr Robert Robinson, state physician and Professor of Anatomy at Trinity College, Dublin: four years later the house appeared on Roque’s map of the city. With a red brick facade, of three bays and four storeys over basement, the house’s exterior is most notable for its fine Doric tripartite limestone doorway, the lintel carved with a lion’s head and festoons. Inside there is (or perhaps was, the building has been closed up for some years), a splendid carved wooden staircase and on the first floor front room with beautiful rococo plasterwork. In the 1880s the house became the Catholic Commercial Club, a century later demolition was proposed but somehow it survived, becoming an extension of the atrociously designed and ludicrously named Royal Dublin Hotel, built in the late 1960s and within four decades (rightly) torn down: where it stood is now a large hole in the ground and a wide gap in the street. Meanwhile No. 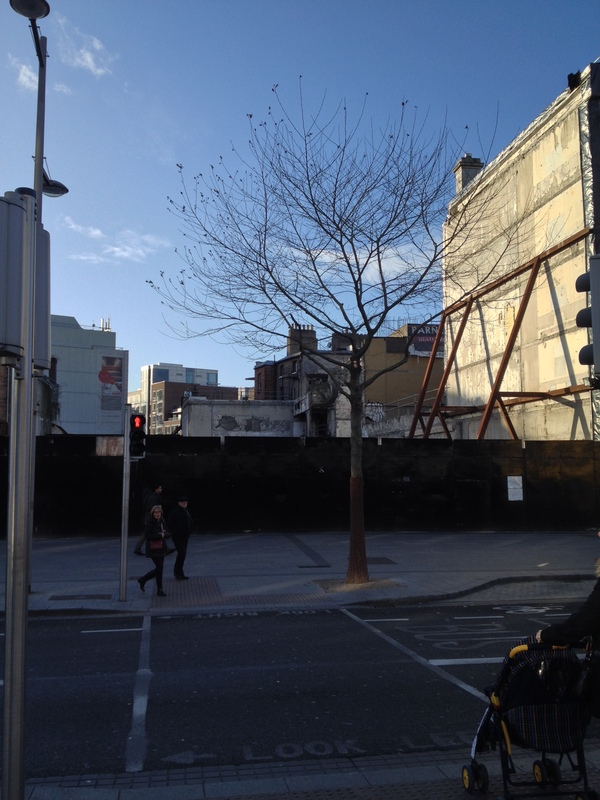 42 to the immediate south – another part of the Chartered Land site – is left to moulder: a fitting symbol for how much we in Ireland value the buildings left in our care for the benefit of future generations. 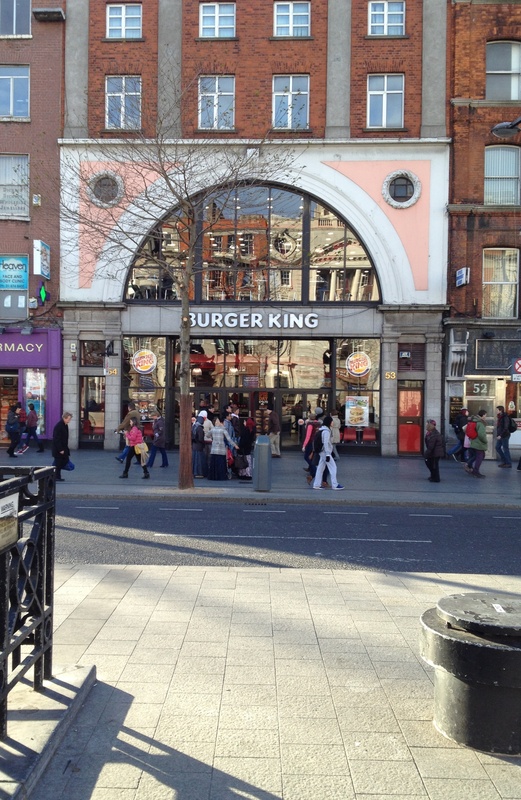 After decades of allowing, indeed encouraging, the decline of the capital’s main thoroughfare, in 1998 Dublin City Council announced an O’Connell Street Integrated Area Plan (IAP). However, never known for rushing into action, the authority then lingered another four years before actually engaging in work on the street. Some of what it deemed the more significant features of this project included widening footpaths and the central pedestrian section, the installation of new street furniture and free-standing retail units (although the latter pretty soon disappeared again), the restoration of existing sculptures and on the site of Nelson’s Pillar the installation of a 398-feet high stainless steel pin that was somehow supposed to become a symbol of Dublin in the same way as does the Eiffel Tower for Paris or the Statue of Liberty for New York. Quite how something that resembles an enlarged knitting needle was to accomplish this feat was never satisfactorily explained. 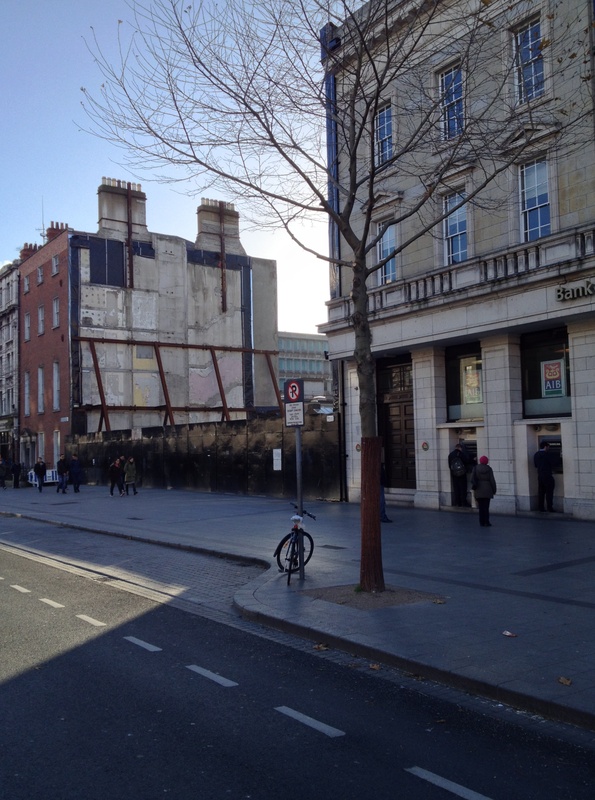 As part of the same regeneration programme, Dublin City Council also cut down all the existing trees on O’Connell Street, some of which had been there for 100 years, and replaced them with other trees. The entire exercise, which took four years to complete, cost no less than €40 million of public money. 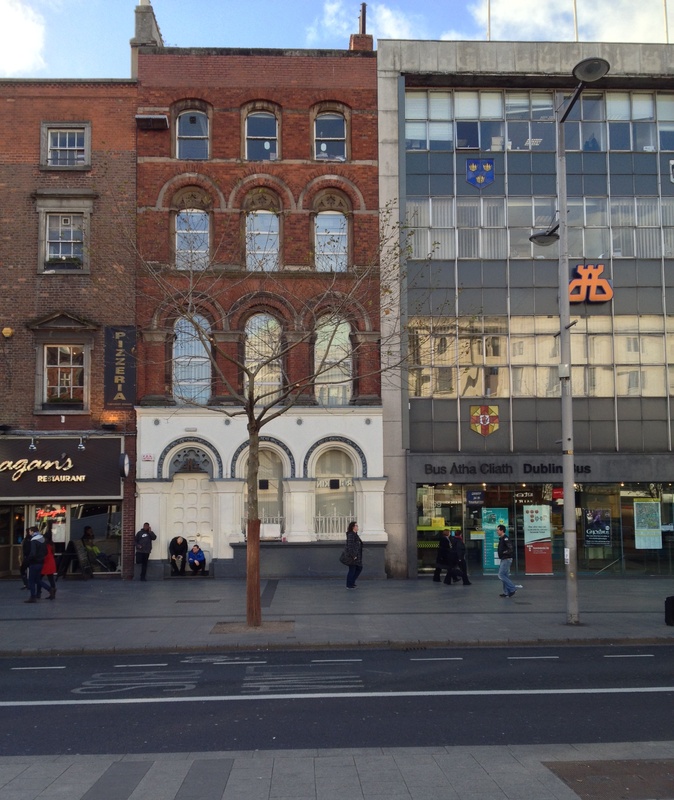 In addition O’Connell Street has been designated both an Architectural Conservation Area and an Area of Special Planning Control (apparently these safeguards ‘strictly govern all aspects of planning and development on the street’). Furthermore, the majority of the street’s buildings are now classified as Protected Structures. 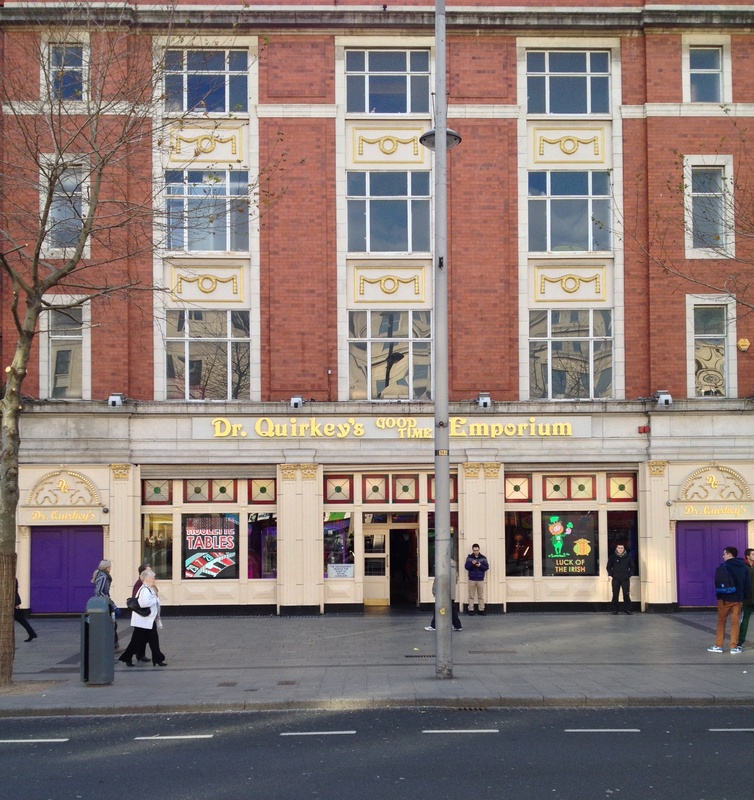 It is exceedingly difficult to understand quite what such designations and classifications have done either to safeguard existing structures or to improve the overall character and appearance of O’Connell Street. 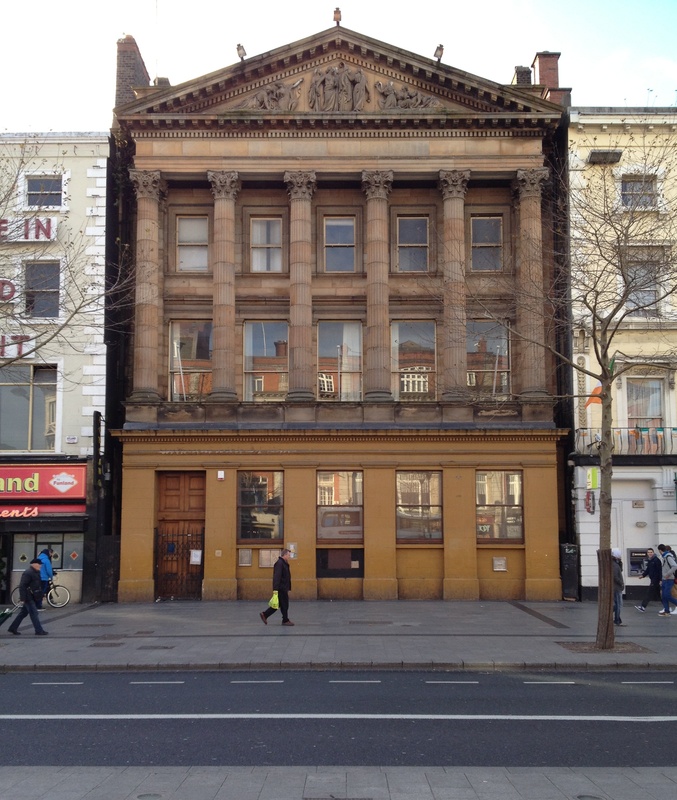 This entry was posted in Architectural History, Architectural Horror, Dublin, Heritage at Risk and tagged Architectural History, Bad Architecture, Dublin, Heritage at Risk, O'Connell Street. Well that got my blood boiling this Monday morning. It’s such a disgrace what has been allowed to happen to this street. It should be the focal point of the whole city. DCC have so much to answer for. Poor planning and corruption have utterly destroyed our capital city and it still goes on today. 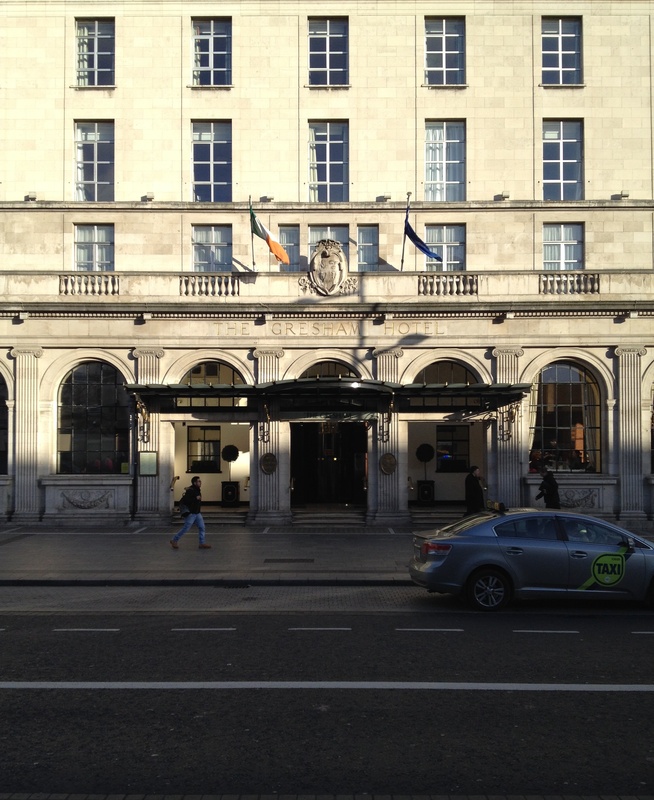 My grandmother, who’s approaching her 100th birthday speaks of O’Connell Street in its hey-day as a beacon of old fashioned glamour, lined with elegant tea rooms (The Metropole among others) and opulent hotels. Today they have been replaced by fast food outlets and vacant lots. I usually just avoid the area now as it upsets me too much. My apologies for giving you such a blood-boiling start to the week. But your grandmother is right: I remember when I first came to Ireland in the mid-1970s much of Dublin, and O’Connell Street were in infinitely better shape than is now the case. So much for the city fathers having care of their responsibilities, and for the notion of progress…. Excellent description of O’Connell Street’s current depressing state That a street of such fine overall ‘Boulevardian’ proportions and with some great architecture, should be ignored and allowed to degenerate on so many levels for so long, it is almost criminal. Let’s hope some of those responsible for allowing its current state prevail, read this post. Would you consider having some of your articles regularly published in say the Irish Times? maybe informing more of the public, and reminding the powers that be in a public format to the sorry state of known and lesser known architectural neglect within Dublin City. It may by a thousand cuts over time, shame those responsible from doing nothing/badly – change for the better. here’s hoping! Thank you for your kind comments: I fear the Irish Times would have no interest in such pieces any more. The internet and public forums seem to be the best way to advise people of what is taking place, so please spread the word and encourage more visitors to The Irish Aesthete. Hear hear! When I lived in Dublin I used to have to walk down this street every morning to get to work and then up the equally ugly Pearse Street (though in fairness, Pearse Street was never intended to be monumental). Is this the impression Dublin City Council want to convey to tourists from all over the world? Can anyone imagine the French letting the Champs Elysées get into a similar state? 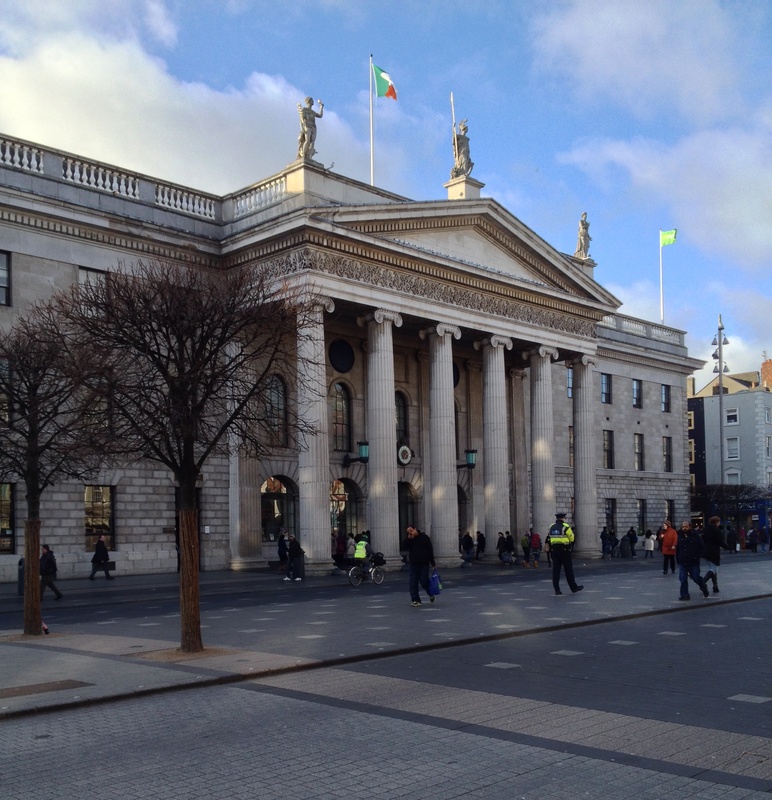 Dublin City Council never seems to have had the best of ideas when it came to preservation. The Wood Quay site been another major blunder in the not too recent past. P.S. I sent those shots of Donegal thatched cottages on to at your wordpress email address, just check and let me know you received them. And yes, I remember Wood Quay, and marching in protest over what was taking place there. I’ve just read your whole article. I am 40 years of age and even in my early teens, I remember thinking O’Connell street could be so much more beautiful than it was. It has all the elements to be a breathtaking boulevard where we would be delighted to show tourists around. Now sadly, it is a street I occasionally rush through to go somewhere else. I do sometimes stop and notice some of the stunning buildings you mentioned. Overall it has always been to me, a wasted beauty. It could be our crowning glory. Grafton Street is charming with its curves and often seems like our main thoroughfare. O’Connell Street could be so stunning if there were more care and if people like you were on the Dublin City Council. I often think Dublin could be the jewel box of Europe. Do we need fresh, enlightened, aesthetic blood in Dublin City Council? Yes. It is criminal to waste the foundations of the beauty that was created by previous generations. On that note, Robert, you would be the perfect person to establish the first: Irish Aesthetic Preservation Council – I.A.P.C. Or at least you and some of the people you might know. Or, in my ignorance does such a council exist? And is not doing a good job? Either way, thank you for the time you put into this site. It reminds me how important beauty and preservation is and how much I love our country, which I often take for granted. Thank you, most kind. Actually one rather hopes that organisations such as the Irish Georgian Society, or in relation to the capital, the Civic Trust, already do the job of the potential IAPC you propose. But of course one matters is whether the appeals for greater aesthetic appreciation are heard, and the advantages of same are understood. Regretfully I think at present this is not the case: the Irish populace by and large (and allowing for exceptions) remains stubbornly averse to the merits of the visual. Yes and surely surely it is in the manifesto of all these organizations: the Irish Georgian Society, the Civic Trust and the Dublin City Council to maintain, preserve and safeguard the well being of our country’s aesthetic heritage? Do they need appeals from the Irish populace to fulfill their very important role? In my post and in any other role I have ever had, if I had failed to rise to my job spec., I would have been given 2 verbal warnings, 1 written warning and I would have then been let go. I don’t understand how the negligence I see on your site can happen? Maybe I’m terribly naive about the job description of employees in these organizations? Perhaps it has to do with funding? It could be their hands are tied? It feels strange. Meanwhile, I do acknowledge the very good work all these organizations have accomplished. New blood? New job descriptions? IAPC? I hate to have to tell you this, but this development IS going ahead, albeit with changes to the original design. It is, however, still a monumental travesty. It is ludicrous and delusional and yet it is still being pushed through. It seems to me that the intention is to sneak the demolition of buildings on the “1916 Terrace” in under the radar before the centenary gets much closer and draws too much attention and interest to the area. They plan to tear down the building which currently houses the Paris Bakery in JUNE…I agree with the poster above; write to the Times! 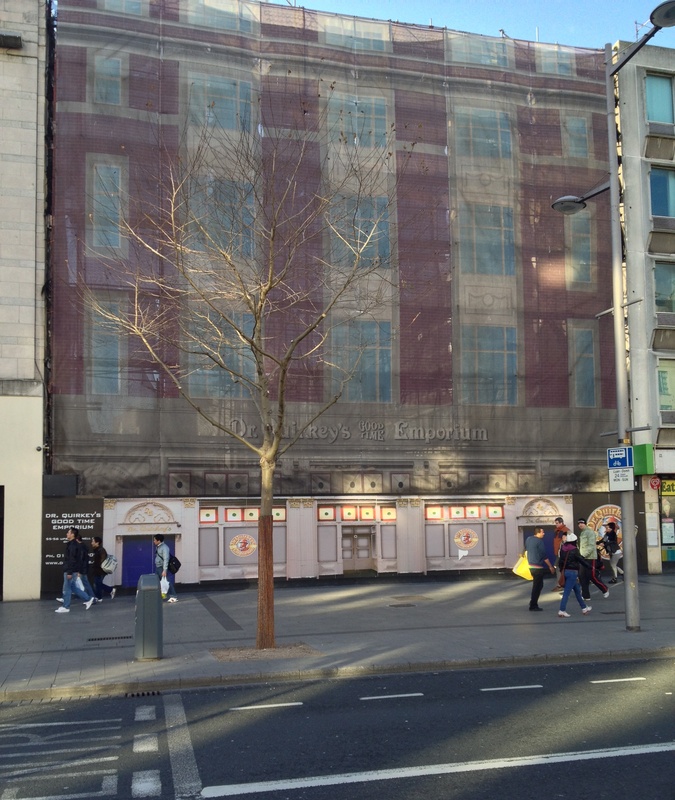 Any idea how many individual buildings there are on O’Connell Street? I’d like to photograph them and wouldn’t like to leave out any unwittingly. I worked in the studio of Roberto Morisi in Milan in 1966 when I was an architectural student. Corriere della Sera reported the blowing up of Nelson’s Pillar and I showed the article to Morisi. HIs reply: ‘You Irish are uncivilised’. I felt ashamed and even more so when Dublin Corporation completed the destruction. I think the rot in O’Connell Street must have started then. By the way, if I remember correctly, Henry Moore also gave part of his name to Mellifont Lane (or street? ), later Elephant Lane, and now Cathedral Street. In the early 17th century Garret Moore was (very briefly) Baron Moore of Mellifont before being made Viscount Moore of Drogheda: Mellifont was at the time their principal seat (before they moved to Moore Abbey in Monasterevin), hence the use of that name.